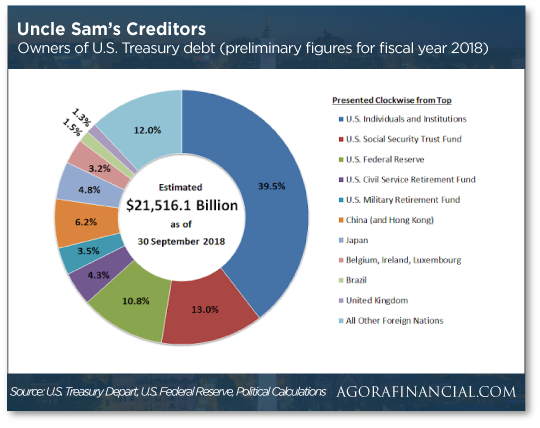 Who owns U.S. Treasury debt? KW: Corruption abounds. American pension funds and institutions own over 70% of the debt they have used to stay afloat that can never be repaid. What will happen? your guess is as good as anyones. Foreigners own about 29% of the national debt, with China still being the biggest foreign holder, at 6.2%. For all the caterwauling you run into on the internets about China dumping its Treasuries — the so-called “nuclear option” — China’s total has held quite steady over the last year between $1.12 trillion and $1.18 trillion.